You can set up the layout settings for the portfolio stream tiles here. With the Add row button you can add one or more rows to the pattern. After the 5. element (end of the 2. row) the first row will be applied again in the front end. Unless you limit the pattern instances inside the shortcode. Menu order: you can add a menu order number to each Portfolio item in the WordPress editor. 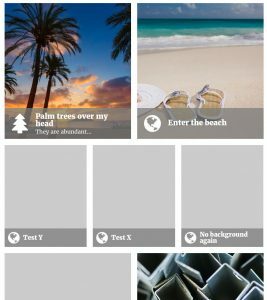 By selecting this option you can fully customize the order of the tiles. Post IDs in shortcode: the tiles will appear in the very same order they are added to the shortcode. Use it with the ids parameter of the shortcode, and you can make super-customizable tile streams. Default Button class: you can add a HTML class to the buttons by default. This is useful when you want to add special formatting to the button links. Hide icons: if enabled, the icons in the title line won’t be displayed. Responsive behavior: by default this is enabled. Turn it off if you experience layout problems with non-responsive themes. Responsive breakpoints: here you can define when to switch to less number of columns (under what window width). Please note that these breakpoints only work if the basic front end CSS is loaded. Load basic front end CSS? : highly recommended to leave it as “Yes” – unless your theme’s code covers all the styling settings for the boxes. Delete data on plugin uninstall: in some cases website administrators would like to keep the plugin data in the database for future use – even if they remove the plugin. You can set this to “No” if you don’t want to use a-folio plugin any longer, but you’ve added lot of Portfolio items using it in the past. In this case you can use the stored data with a custom script. In 99% of the cases the “Yes” setting is the better choice, as with this setting the plugin’s uninstall process won’t leave any junk data in your database.